good morning, I am starting to wonder, now that Ive got my reservations for may 25, 26, 27 am I going to freeze? I think I will be ok but Ive talked my husband and friends into this trip, and now it dawns on me its gonna be cold. None of us have ever been to Yosemite, we are old (ranging between 47 to 65,) out of shape house dwellers. I am so excited to come, but I have begun to wonder what Ive gotten us into. looking for ideas and suggestions to convince friends we will be fine. Not necessarily. You are going to be staying relatively close to the car - take two sleeping bags, or extra blankets, and your layers - fleece jacket, bulky jacket, gloves - whatever you need to be cozy in the 30-40F range at night. Consider also whether you are going to want to walk around and be active after sunset or if you are going to pile into bed early. Some cozy synthetic long underwear would probably help you a lot. Look at Sierratradingpost.com for some expedition weight base layers for less money - they make great cold weather pajamas and you can also wear them under your clothes. Also look at getting a nice fleece hat and warm socks. If your feet, hands and head are warm, you will feel very warm indeed. Costco has four packs of really nice thick wool socks - I believe they are Smartwool, a good brand, rebranded as Kirkland hiking socks - I use them to sleep in and to hike. Really nice. Thanks for your reply, Yes we should be just fine. I,ll just put ear plugs in so if everyone else is whinning and crying about being cold Ill just sleep right through it. I wonder if I can hear bears with ear plugs in ?? As long as you store food properly you won't need to worry about the bears, even if you hear them. Have a great trip! Lots to do and see. If you can manage a short hike and Glacier Road is open, Sentinel Dome would give you great views with less crowds - kind of fun to stand up there identifying peaks. do you think we will have crowds? I was hoping by getting in and out of the park before the holiday weekend we might miss the crowds. The valley is crowded from April to November with May being very busy. The waterfalls are spectacular in May so they attract a lot of people. Take a look at yosemitehikes.com for some idea of what trails are like. I would suggest to non-hikers the Mist Trail (turn around when you are ready - most people make it to Vernal, the trail between Vernal and Nevada can be a little much especially if a lot of sun exposure bothers you). Also Taft Point and Sentinel Dome - taken as slow as you like. You can also hike around the valley, there are a lot of trails with little elevation gain - the good thing is being able to hop on the free shuttle when you are tired of walking. Mariposa Grove is walkable, or you can take the shuttle to the top of the loop. Walking around the meadow/golf course in Wawona is also nice, and you're pretty likely to see deer. If you don't want to drive it's possible to get tickets for the bus to Tuolumne Meadows, which is another nice place to walk around. Going up Lyell Canyon for a while is a nice stroll, as is walking around the meadow. In May, it should be way more spectacular, with way higher flow. Going all the way up Nevada is a tough hike if you're not used to doing this kind of stuff, as it's steep and there is little shade as previously mentioned. Still, it's worth pushing through if all you're battling is a little fatigue and nothing more serious (like a leg muscle flaring up or a headache from altitude). You could always just take a lot of short breaks (1 minute or so), as nothing says you have to complete the hike as fast as experienced hikers do. Longer breaks for anything other than lunch aren't recommended though, as they can rob you of your willpower and allow lactic acid to build up (according to my brother who does extended hikes of 150-200 miles every other year). 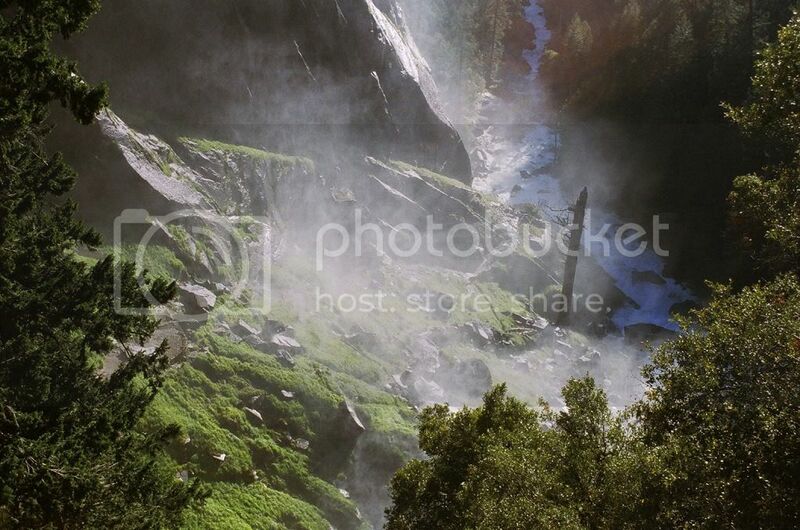 Hers a shot I took at the top of Vernal Falls in early July a few years ago. It's definitely worth making it up this first one. If you're not up to longer or medium hikes (say over a mile), still try the short hikes. Yosemite Falls trail from the Northside Drive is short and goes through a forest and creek area. Bridalveil Creek is also a short walk. Stop along the Northside and Southside Drives and look around at turnouts. Glacier Point is not to be missed. It's a short walk from the parking lot at the end of the Glacier Point Road. And of course Inspiration Point (Tunnel View) on the south road into Yosemite Valley. Take the Valley floor tour--it's in an open air tram. A ranger rides along and gives the tour. Also take the open air tram in Wawona Grove at the south end of Yosemite National Park. The Mist Trail doesn't offer anything approaching the heights of the Grand Canyon for sure, but there is one place where you're walking a skinny path with the mountain on one side and a fence on the other just before reaching the top of Vernal Falls that could definitely be uncomfortable for anyone nervous around heights. One very good thing about the Mist Trail is that it's easy to turn back if things are going wrong, since the return is all downhill. I definitely second driving to Glacier Point. The waterfalls will be AMAZING that time of year, and you'll have great views of at least three of them (Yosemite Falls, Vernal Falls, and Nevada Falls). I can't remember if you can see Ribbon Falls from there, as it was dry by late August when I went last time. I think Illiluoette Falls is visible from there too, but the first three are the really spectacular ones. 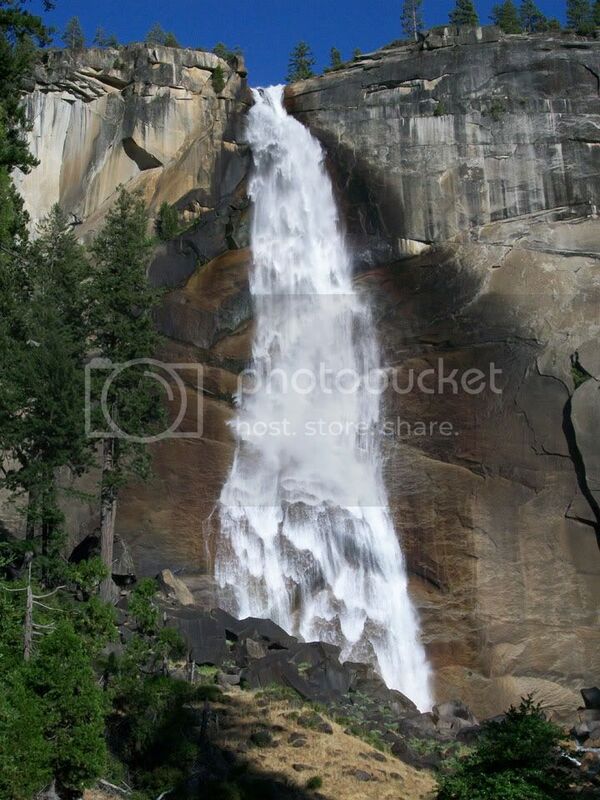 After going to Inspiration Point and seeing it from a distance, you might want to see Bridalveil Falls up close. It's an easy and flat 1/4 mile or so walk from the parking lot, and is pretty cool to see when the flow is high as it will be then. If Tioga Pass Road happens to be open by then, that's also a great drive you guys should consider (all the way out to Mono Lake and back). You get to drive alongside a pretty cool canyon at the end, and get great views of some of Yosemite's iconic peaks like Half Dome, Clouds' Rest, Cathedral Peak, Mount Hoffman, Mount Dana, and many others. Plus there's three really beautiful lakes, Tenaya Lake, Tioga Lake, and Ellery Lake, along the drive. EDIT: It looks like Tioga Pass Road has been open by May 25th in 7 of the last 10 years, so hopefully luck will be with you if that drive interests you! Last edited by baseline bum on Tue Jan 19, 2010 11:11 pm, edited 1 time in total. We are hoping to be able to take Tioga pass from Reno. When I made my reservations a yr ago they included the 22,23,24. But I realized my oldest step daughter was graduating that wkend. Well we cant hardly miss that. Can We? But I do recall looking at the link you provided and seeing that it will be shear luck if the pass is open. maybe it will be maybe it wont be. We have not made any definite plans for anything. I hope it is but if not oh well go another way. This site is great. I was reading another thread and now I know I need to unpack my rip line and my giant deer knife and tin cup. You folks are funny. I would love to live in an area where I could watch people from all over the world. More So I would love to have Yosemite in my back yard. We hike here and never see more then a deer and a tufted titmouse if your lucky. South of Chicago Thnx again for all the info. And the threads you folks start while bored are hilarious. We were just in Housekeeping camp two weeks ago. It actually snowed and rained much of the visit. We have a 2.5 year old that becomes anti-blanket at night, so we were pretty concerned about the cold. We did three things. We brought a surge protector, an electric throw, a plug in oil radiant heater (safe, quiet, and hot as hades) and a tarp which we tied to the outside of the room opening to better seal the room. We made sure our vents were unblocked for fresh air. We were very warm. Too warm even - the electric throw wasn't really needed as we also had our cold weather sleeping bags and liners. We did need to put our towels around the bed to prevent contacting the ice like walls. We also brought an electric skillet to cook our meals in, and that was fantastic. We will be there Tuesday afternoon, Not sure if Tioga pass will be open, not sure what the weather will be like. But I am certain we will have the time of our life. Cant wait !!! The Valley Tour is a sit down, two hour tour everyone can do. Don't miss it.